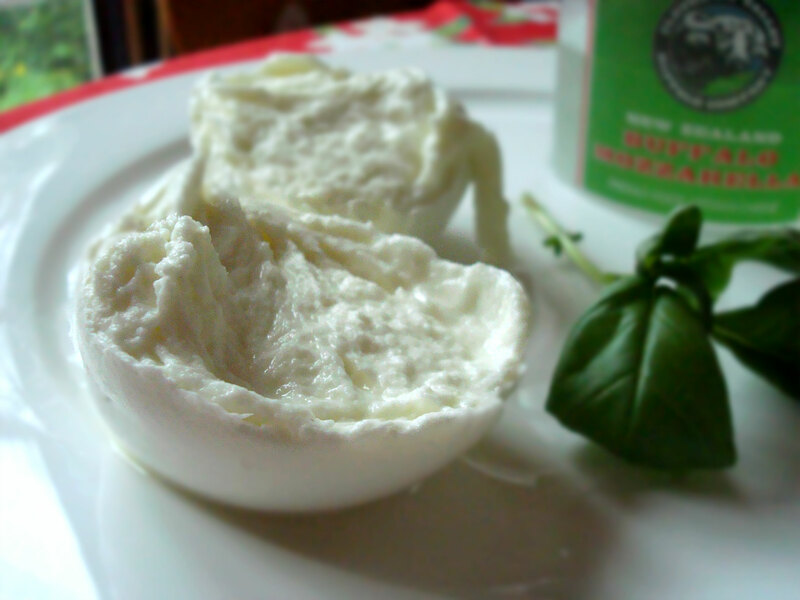 There is a reverence to the way my friend Kate breaks Mozzarella di Bufala. The same gentleness of hand, sense of purpose you see in a priest breaking bread. 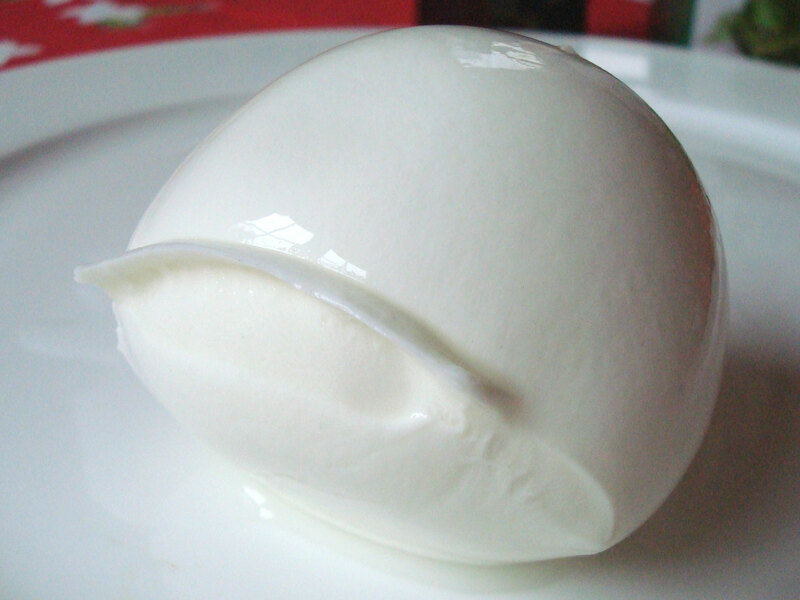 For fresh buffalo milk mozzarella is indeed a special cheese and in this post I want to understand why. First of all though you have to banish all memories of those rubbery gourds of commercial mozzarella, vacuum packed and available in the supermarket. The only similarity is that both are stretchy when heated. One is pizza cheese, mild and factory produced, the other is an Italian icon, a national treasure, made with an ancient breed, hand spun and needing to be consumed quickly. Real buffalo mozzarella arrives in a bath of whey. It has a short use-by date, to be consumed within days or weeks of making. Eating it this fresh was a treat we could only read about in New Zealand until recently, until some folks took a punt and imported a herd of buffaloes. 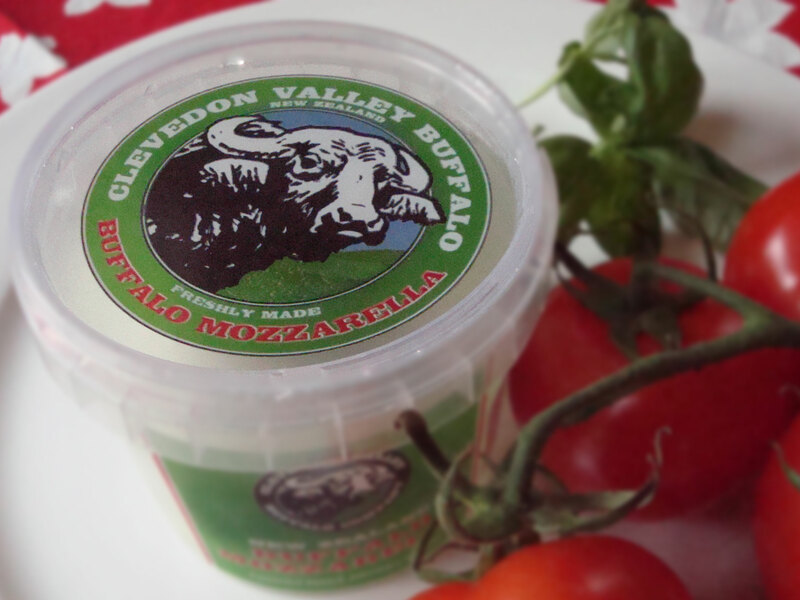 Enter the Clevedon Valley Buffalo Company, owned and operated by Richard and Helen Dorresteyn. They farm 200 head of buffalo for their porcelain white milk and make a range of products. I love their plain Buffalo yoghurt, it is like eating purity. Just on its own. Angels in a punnet. The Dorresteyn’s buffaloes aren’t the kind you’d find stampeding across the plains in cowboy movies. They are instead water buffaloes, originating in India, farmed in Italy around Naples for centuries. They are big horned, jet black uber-cows, producing a pure white milk. And oh Lordie do they produce a delicate cheese. Like all great cheese it’s a little more costly, I happily stumped up the $10 for a punnet of their Mozzarella from Moore WIlsons. Like Kate I carefully removed it from the punnet and gently broke open the delicate ball, its outer layer so smooth it threatened to slide off the firmer interior. Inside it’s the texture of cooked chicken breast, moist and glistening with the final vestiges of trapped whey. It’s a little floppy, and the taste is delicate, milky yet delightfully light in the mouth. Mozzarella is a pasta filata, a stretched curd cheese. The curds are heated after separation which changes them from a set custard consistency into a stretchy mass. Pieces are tested by holding them up so that they stretch like a thin dough until they are spun into balls and put into cold water or brine to set. I made an Insalata Caprese, the classic mozzarella, basil, tomato and olive oil salad and it was a revelation. I’ve had versions of this on a few occasions, and to be frank, always thought it a bit over-rated. But this was the first time I’d eaten it with fresh buffalo mozzarella. Now I get it. This wasn’t little rubbery white discs of cow’s mozzarella balancing on a tomato, dressed in oil. This was a heady fragrant joy. I can only assume there is something in this mozzarella, something that captures the fragrance of the tomatoes, basil’s spicy notes and olive oil’s herbaceous tones. A milky angel that drinks up droplets of fine olive oil and blends these essences in its striated surface. This is a smell of Italy and I urge you to try it. I used Moon Over Martinborough’s beautiful oil. It was a gift from Jared Gulian at the New Zealand Food Bloggers conference and it is delicious. Thankyou! We drunk this with a Chardonnay. And while it was fine, it didn’t sing. I think next time I’ll try a Rose, a Pinot Gris or better yet a Pinot Griggio. Something with a little more sweet to join with the salad’s beautiful sweet fragrance. Great post Lucy. Made me want to go out and buy some buffalo mozzarella NOW. But one thing I find hard about making a decent Caprese is getting the right tomatoes. It’s so hard to work out just by looking at them if they are going to be sweet enough to do the cheese justice. Any tips? Thanks Moerangi, Try smelling them? Also I learnt a trick from Jamie Oliver to make them taste more intense. Slice them up about 20 minutes before you’re going to serve and salt them. He says to sprinkle on more than you would normally. I use Maldon or Marlborough salt flakes. Leave them for 20 mins, drain and then serve. They will be more way more flavoursome. I did enjoy the post about the buffalo Mozarella . Wonderful feta & Blue they make too. 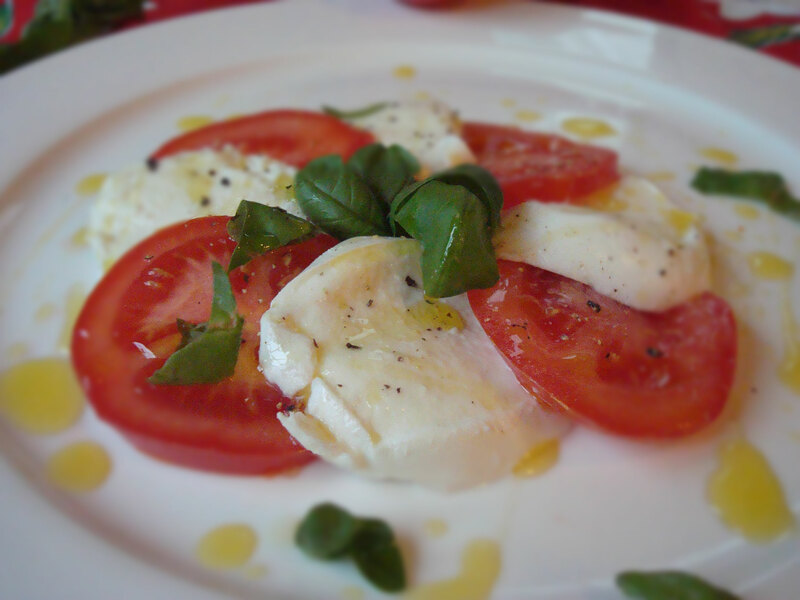 I`ll try your caprese salad recipe very soon . 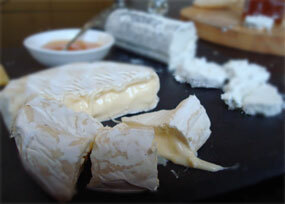 I`m selling a delicious curd cheese from Evansdale Cheese now at Hill St Farmers Market – Caerphilly . A bit richer than the one they make in Wales my Welsh friend tells me. An other person said it tasted a wee bit of iron ! ? Good in salads , melted on veges & crackers . Hi Sally, I must come and visit you at the market and will try to get over this weekend. I am keen to try Caerphilly, I am fascinated by a Welsh cheese. And I look forward to trying your new blue. Do try to call in at the market this Saturday . It would be lovely to see you again. They had a dreadful time at Hill St Market last Saturday – practically blown away ! I can`t guaranteee that Colin will send up the cheeses I order – thats how it goes . I think the Gypsy Kitchen here in Strathmore has Buffalo Mozzarella and the local Greek shop has good oil (which I drink from a glass) – – – so when my basil has grown and the heritage tomatoes are warm on the vines I’ll be making your salad. No good wine shop close by though. Ooh heritage tomatoes – yum, I can almost feel the sun on my face as I type. I am sure you will be able to rustle up a bottle somewhere! I feel embarrassed to admit I have never been to Gypsy Kitchen – now here is my excuse. Thank you for the lovely review. I has been a great journey bringing the buffalo to New Zealand and it is wonderful that people understand why fresh buffalo mozzarella and bocconcini is such a treat now. We enjoy making all our cheeses and yoghurts, we have started bottling the milk and we are currently working on a yoghurt based ice cream that we will launch later this year. The River Cafe cookbook “two easy” has an amazing array of ideas for buffalo mozzarella – combinations that work as well as the insalata caprese. If you are in Auckland again give me a bell and come and meet a buffalo. Thanks Helen, I saw the buffalo milk at Moore Wilsons last week. I’ll hunt out the recipes as I think I might be addicted! Love to meet the buffalo, they look gorgeous on your website. Another reason to visit Auckland again soon. Ooh thanks for the tip Mairi- I think they are called Whangaripo Buffalo Cheese Company and they sell at the Matakana Farmers Market. Another reason to plan an Auckland and beyond trip! Glad you’re enjoying the oil. Looks like you’re putting it to good use. We love this with fresh tomatoes and basil from our glasshouse, and of course olive oil from our grove! Yum. Home grown tomatoes and basil – I can smell it now. Such a heady taste of summer. I’ve drizzled your oil on my Labneh yoghurt cheese. Looks very pretty and tastes fantastic! Keep it coming – I’ll need more soon!